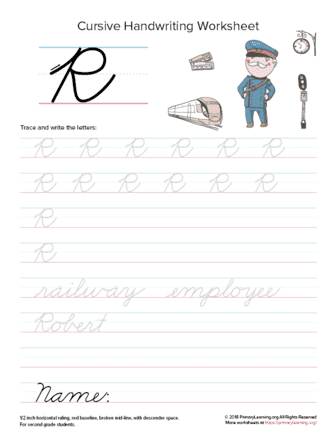 Railway Employee Robert is here to help your students practice the Cursive Uppercase Letter R! Kids learn how to form the letter, they practice tracing and writing. Students learn the occupation that starts with this letter. Included is the Cursive Uppercase R version of the printed letter. Letters are based on Zaner-Bloser handwriting style. This handwriting worksheet has 1/2 inch horizontal ruling and is suitable for second-grade students.